* The boxing and fitness club DCBFIT opened last week in the ground floor of Capitol Hill Tower, at the corner of New Jersey and L SE. While their web site makes me tired and sore just looking at it, I'm sure there are plenty of folks who will find this offering intriguing. * Gordon Biersch, coming soon to 1st and M, has "Now Hiring" signs up: go to Work4GB.com. * Also hiring, according to commenter JT who passed along the Craigslist link, is the Park Tavern at Canal Park. The Hill is Home says that it's opening "very soon," even saying "around the 20th of February," but We Shall See. * Nando's Peri-Peri now has signage up at the Boilermaker Shops--it's a little more than halfway down Tingey between 3rd and 4th, closer to the Bluejacket end of the building. It's supposed to be opening this spring. * The Navy Yard portion of the Riverwalk was supposed to reopen today--anyone give it a shot yet? And, if so, is there any actual trail once you go out the east gate? As I showed a couple of weeks ago, the old asphalt had been ripped up as part of the 11th Street Bridges work, though of course it will be back at some point. * Maybe now is finally a good time to mention the opening of petcare store Wagtime Too at 900 M Street, where it has been for a number of weeks now, offering boarding, daycare, grooming and "cool stuff." And I actually have taken a photo of it. * Apparently the Quizno's at 8th and Potomac closed permanently back in December. And Chicken Tortilla at 8th and L was closed when I walked by a few weeks ago, though I don't know the story on that. UPDATE: Yes, the Riverwalk is apparently open. And I meant to also mention that Kruba Thai and Sushi's web site is now up and running. Quiznos/Chicken Tortilla - USMC barracks maybe? What ever happened to the Georgetown medical office that was supposed to go in the ground floor of CHT? 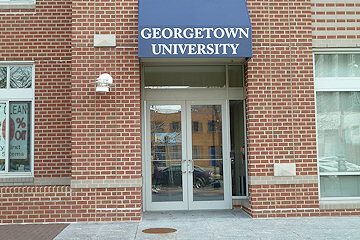 You mean, into that spot where there's the big Georgetown University awning? Chicken Tortilla shouldn't be closed for long. There's a crew inside installing new equipment. Quiznos, however, is gone for good. Can't say that I'll miss it either. That corner would make a nice beer and burger style tavern. Good to hear about Chicken Tortilla is not closing permanently. I liked having a reasonable to-go option with easy parking. It would be nice to have a beer/burger place there - or anything but a quiznos for that matter - but are the property owners just sitting on the location for now? I know their have been rumors surrounding potential development at Blue Castle, but that seems a long ways off. "part of town you're talking about is a school free gun zone..."
Haha @58Model...a good one. @Eric is incapable of catching a sarcasm. Curiosity: Anyone know what's up with the second hole in the wall at the HT/Parcel D lot? It looks like (as of this morning) that they are rebuilding that entire wall section and not putting a road in. The Navy said it was because there was a problem with the card readers/security stuff on the turnstiles from the trail into the Yard proper, and so they closed the trail to keep the facility secure.